About 15 percent of the edentulous population has dentures made each year. Edentulism affects our most vulnerable populations – the aging and the economically disadvantaged. Without the licensure of denturists, these people are at risk of receiving dentures that are below standard. 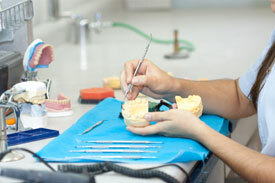 Denturists are professionals specifically trained in creating oral prosthetics. They work with patients from start to finish, learning the medical and dental history of the patient, taking impressions of the existing teeth, aligning the dentures, and providing follow-up for a good fit. Working with one professional during the process allows the customer to become comfortable and speak up when they have questions or need assistance. These elements combine to make licensed denturists an excellent choice for oral prosthetic services. Their experience offers an advantage over a dentist who may know the procedure but doesn’t practice it routinely. The combination of education and experience will result in higher quality craftsmanship.